First Line: On March 23, 1913, the United States of America was reminded that when it comes to nature, we're not really in charge. This is the often gripping story of how storms and floods of almost Biblical proportions first began with a series of tornadoes that killed 150 people in Omaha, Nebraska, and then continued on to ravage fourteen states-- and every river east of the Mississippi. The rain went on for days, and once started, the flooding seemed as though it would never stop. It was America's widest spread flood ever. More than 700 people died, hundreds of thousands of homes and buildings were destroyed, and millions were left homeless. This disaster proved that America had no real flood control, and the government set out to change that. Laws were passed, dams were built, and the techniques they used have been held up as a model for flood control around the world. The author grew up hearing stories about the flood in Ohio from family members, and once he became an adult, he decided to check into it a little bit. What he learned shocked him and formed the basis for this book. The sections describing the floods and devastation at times reach the quality of the best fiction: a swift, sure pace, and first person accounts that draw the reader right into the narrative. Only once did I feel that Williams stumbled, even though he was trying to prove a very important point. When writing about drowning victims, he refutes the idea so often found in literature that drowning is a poetic way to die. It is anything but poetic, and Williams rapidly proved his point, but he continued at such great length that it completely threw me out of the engrossing story he'd been telling. 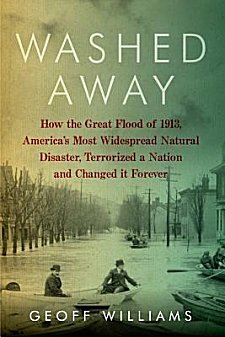 Complete with many illustrations, Washed Away tells of a critical time in American history and reminded me that so many things which we take for granted today have their origins in our country's reactions to some of the worst things Mother Nature can throw at us. Cathy - What an interesting topic for a book! It's an important part of American history that doesn't get the kind of 'press' that some other events have gotten. And yet, for the people affected and their families the flood was life-changing. Thanks for sharing this one. You're welcome. I've always been fascinated with weather and weather-related disasters, so I do like reading about them and how they spurred people to make changes in how things were handled. This is the kind of non-fiction I love, but that one hits close to home right now. All it's done is rain around here for weeks now! I just came back from Bisbee where it rained three out of the four nights we were staying. Needless to say, there's been problems with flooding down there. Hope things have calmed down in your neck of the woods by now!